Quantum Pearl utilises seven high-power energy-efficient RGB LEDS, proximity sensing technology and a powerful microprocessor with custom software. It has DMX and MIDI capability, enabling networking and sound generation. Size: 540 x 540 x 80mm, weight 6Kg, power: 24V power adaptor. 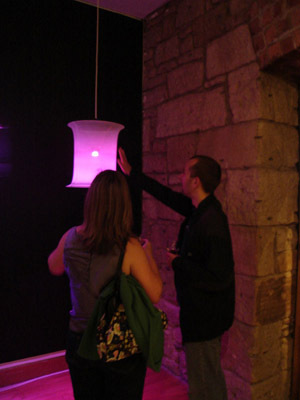 Mimelight has been established as a vehicle for the commercial development of interactive lighting products, the first product being Quantum Pearl. 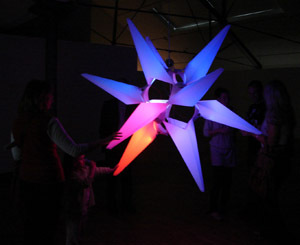 Its designer, Richard Brown, has been granted the UK Patent GB2420457 “Lighting apparatus with proximity sensor”.and works as a artist, inventor and entrepreneur creating interactive and mimetic experiences using a wide variety of media, including the digital, the analogue and the chemical. His works explore the perception of space, time and energy encompassing ideas from cybernetics, artificial life, interaction design, emergence, complexity and alchemy.